DC Comics originally tasked writer J.M. DeMatteis to come up with a new series that would focus on DC various magical properties. Although the project initially fell through, DC later approached Neil Gaiman to pen the mini-series. Gaiman introduced the young boy Tim Hunter as his protagonist and had four mystics John Constantine, Phantom Stranger, Dr. Occult and Mister E lead Tim on a journey acrros time and space while meeting almost every magical or supernatural character in the DC Universe. 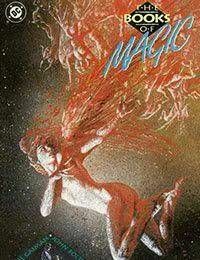 Each issue was painted by a different artist, John Bolton, Scott Hampton, Charles Vess and Paul Johnson.The series proved popular and Tim Hunters adventures continued into the Mister E mini-series and Arcana Annual before landing his own ongoing The Books of Magic in 1994 under Vertigo. Although this miniseries was published by DC, the numerous spin-offs were all published under the then new mature readers imprint, Vertigo.